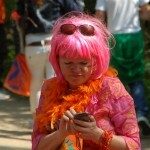 It is not the current Queen, Beatrix, birthday but the birthday of her mother the previous queen Juliana, it remains the official annual holiday. I still remember the fireworks on August 31, one day after our mother’s birthday, of queen Wilhelmina. 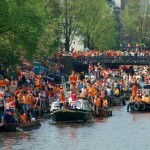 Then every self respecting Dutchman displayed the national colors from the window sill or on a flag pole and wore a small orange ribbon. Now you see very few flags but as the pictures speak for themselves every self respecting (and even non respected Dutchmen and wannabee Dutchmen/women) Dutch burgher is decked out in orange. On this day the city allows any one to clean out their garages and attics and sell their wares on the street. It is one great party. 300,000 travelled by public transportation into the city since yesterday and all are leaving this afternoon/evening. 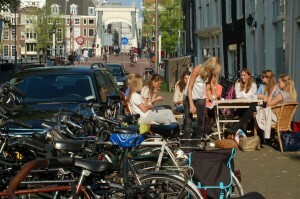 Many of the streets are blocked to other than pedestrians and bicycles. There were streams running across the Leidse square where the porta potties were overflowing from the beer guzzling party crowd. Empty beer cans and trash everywhere. But by the time the Queen has read her morning paper the clean up crews will have this all under control. The weather is still incredibly pleasant. Read my lips: It will go back to normal when I leave here on Tuesday. The Romanians will be my next benefactors. Only Dutch Men can look this good in Orange. Ay, Que Linda en anaranjado! 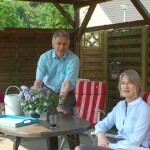 After a couple of much needed showers on Wednesday night, the 2011 Spring feast that started when I arrived here in mid March, continues to spoil us with bright sunny days. I had a busy day. Maria Boonzaaijer of s/v “Yo Soy” drove me from Barneveld to Kleve in Germany to visit mutual cruising friends Sjef en Ermi Keizers of s/v “Vierde Dimensie” in Kleve in Germany. We had met in the South Pacific in 2005. We had lots of good memories to share, catch up on our recent endeavors and plans. Both Maria and Ermi have published books and they are helping me with my writing project. 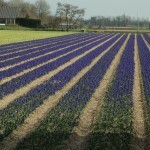 Afterwards I drove from Barneveld to Friesland to meet another distant relative and his family. We have in common my great-great-great-grandfather born in 1769. His 2nd oldest son started a mast and block making business in de Lemmer, the branch I sprouted forth from and the 4th oldest son, Okke S., started a mast and blockmaking shop in IJlst. The IJlst business grew into a thriving wood importing yard in the 20th century. My new found nephew showed me pictures of his great grandfather and there is a definite likeness with my grandfather of the same generation. I have written before that we became aware of each other through my “log” that I posted on the web site about the Napoleon connection with Sybolt Ottes when I visited St.Helena in 2007. While I am writing this, it is time for Easter Sunrise services, at home on the West Coast. Not a European tradition at Easter. I attended 11 a.m. service at Sint Augustinus, the church that is closest to where I spent the summer and fall in 2009, on “Fleetwood” at the “Schinkel” Y.C. This time the congregation took up a whole lot more parking places than the choir. 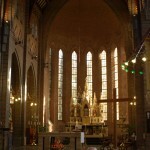 The mass was sung by the two priests and the men’s “Cantemus Dominum” choir in Latin. The women choir and the men sang the English Hymn “There is a wideness in God’s Mercy” from Frederick William Faber, in an arrangement from Maurice Bevan, during the offertory and the recessional was the Alleluia chorus from the Messiah. What a treat! 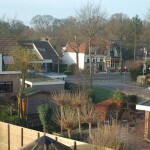 I am back at my sister and Herman’s home in Badhoevedorp for the last ten days of my Holland Holiday. The weather has just about turned into a heat wave. 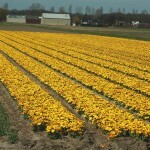 Holland could use some of the rain the N.W. has had in the last 2 months. The dry cold weather has turned into 80 odd degrees Fahrenheit. Happy Easter to all and I hope the Alleluia’s will sound as clear and promising there as they did here this morning. 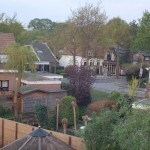 The view from my Heemstede Homestead penthouse after one month. Holy Thursday. In Holland this day is called White Thursday. 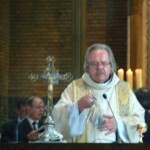 I attended the service in Heemstede. The usual American service includes the ritual of washing of the feet, as was done at the Last Supper. Not here. 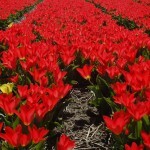 We sang a Poem, put to music, written by Titus Brandsma, “Als ik U aanschouw” (“When I cast my eyes on You”). Very fitting for this occasion. He knew at the time that he was being led to slaughter. Brandsma, a Carmelite Frisian priest, wrote the poem in the Scheveningen prison in February 1942. He died in July 1942 in the Dachau concentration camp. 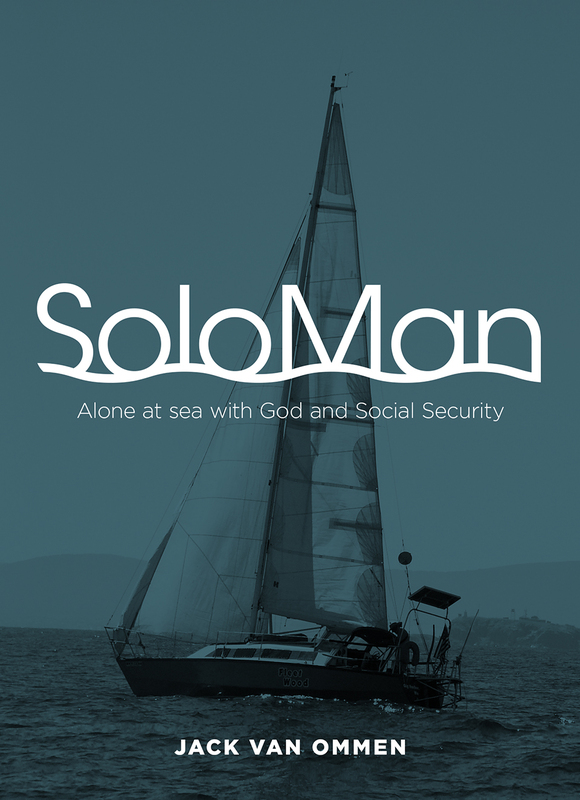 He was one of the first to refuse to obey the Nazi invaders and to compromise his faith. 2579 Catholic Priest and seminarians, 109 Protestant clergymen, 30 Orthodox priests and 2 Muslim immams from 38 European countries were interned in Dachau alone. The majority came from Poland. 1034 of them perished in Dachau, just like father Brandsma. The survivors were liberated by the same 7th US Army under Patton on April 30th 1945 as the women my mother was with from the Dachau satelite camp, the Agfa Kommando. Part of the story I am writing about my mother’s life. Wednesday morning I delivered, to the trucking company, my three heavy boxes with paints, epoxy, spare parts for the repairs and maintenance of “Fleetwood”. Wednesday afternoon/evening I went into Amsterdam. It was just an absolute gorgeous warm summer day. The parks were filled with people soaking in the sun, some brave souls were swimming in the Amstel river already. I met my friend Caro near the “Skinny Bridge” (Magere Brug) across the Amstel. This is very close to where I had my first job in 1955 on the Heerengracht. I walked right by the building and through the familiar neighborhoods. 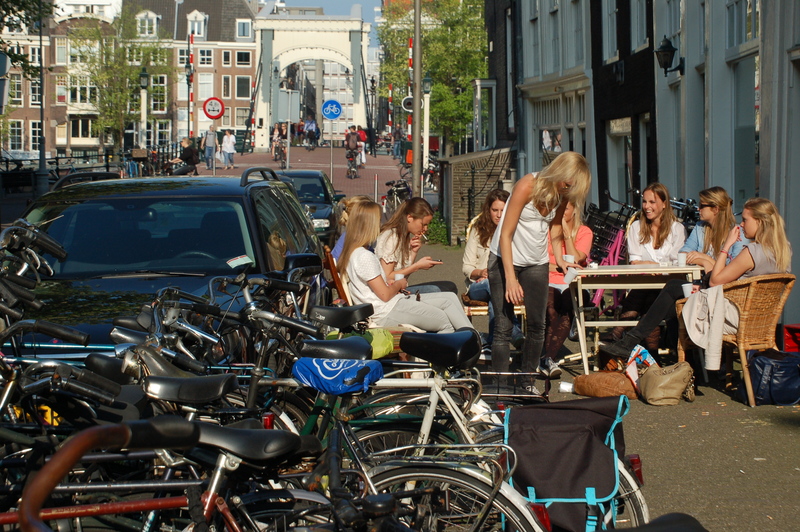 It seemed like all of Amsterdam had left their apartments and congregated on the sidewalks, in parks and side walk cafes. Corrine, my granddaughter, who turned 21 yesterday, has threatened me again that she is going to show up from her study in Rome. And I hope that I can show her my Amsterdam on a day like yesterday. To day was a memorable day. The weather was gorgeous, in the seventies (Fahrenheit). 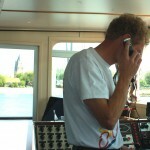 I spent most of the day aboard “Glissando” with Marinus and Leni Hoogendoorn. 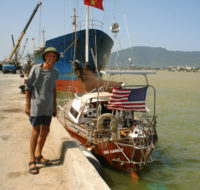 I met Marinus in February 2009 in the Virgin Islands and you will remember that “Fleetwood” was towed up the Rhine behind “Glissando”. 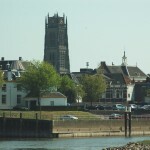 I came aboard in Gorinchem on the Merwede River and they dropped me off in Nijmwegen on the Waal River. 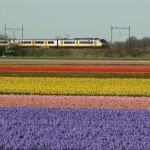 I took the train back to the car in Gorinchem. 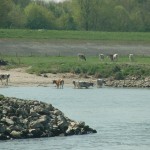 This stretch of the confluence of the Rhine with several rivers which flow past Rotterdam into the North Sea is particularly scenic. Wide levees with brick kilns, pasture land, well preserved fortified midevial towns. 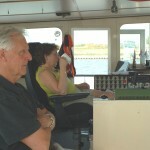 The view from the wheel house over the dikes shows a much larger picture than from aboard “Fleetwood”. “Glissando” continued on to Mainz with a load of Brazilian Soya Beans that they loaded on Monday in Rotterdam. 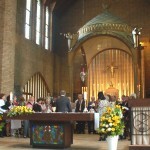 Palm Sunday I attended mass in Heemstede. 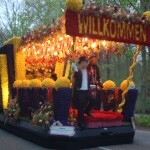 The children paraded in witht their colorful Palmsunday treats, an old Dutch custom in moist of the Catholic churches. The choir sang parts of the St.Matthew Passion through out the reading of the Passion gospel. Yesterday, I met Karel Willem v/d Meer, whose grandmother and my grandfather were brother and sister. We were not aware of each other’s existence till last November when we met through my research for the book I am writing about our mother. Karel is, at least, fourth generation, barge skipper. His grandfather and father plied these these same rivers I was on today under sail. The last twin masted clipper and the earlier pavilion tjalk are still sailing in the Dutch “Brown Fleet”. On of the historic land marks on this afternoon’s river trip is the town of Zalt Bommel. Famous for it’s unfinished church tower. There is a beautiful poem about the bridge of Zalt Bommel. When I read it, it always reminds me of my own mother. 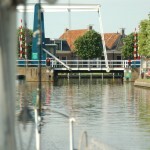 In short it translates that the muse sees a sailing barge pass through the bridge at Zalt Bommel and a woman stands at the helm and sings a Psalm that he recognizes, his mother used to sing. In my book this is a repeating theme where our mother and her group of prisoners sing their way, with hymns and songs, through the hardships of the concentration camps. Ik ging naar Bommel om de brug te zien. Ik zag de nieuwe brug. Twee overzijden die elkaar vroeger schenen te vermijden,worden weer buren. Een minuut of tien dat ik daar lag, in ‘t gras, mijn thee gedronken, mijn hoofd vol van het landschap wijd en zijd -laat mij daar midden uit de oneindigheid een stem vernemen dat mijn oren klonken. Het was een vrouw. Het schip dat zij bevoerkwam langzaam stroomaf door de brug gevaren. Zij was alleen aan dek, zij stond bij ‘t roer, en wat zij zong hoorde ik dat psalmen waren. O, dacht ik, o, dat daar mijn moeder voer. Prijs God, zong zij, Zijn hand zal u bewaren. Uit de bundel ‘Nieuwe gedichten’ van Martinus Nijhoff die in 1934 verscheen. The performance of the St. Matthew Passion, last Wednesday, was very impressive. It was an opportunity that I have not had for many years. There is no other country in the world where this particular choral work is so much an Easter tradition. The choir was the KCOV Royal Christian Oratorio Association. The very same choral group both my father and mother were members of before they married. I am done purchasing and packing my supplies to ship to Romania. And I have now added all the material to my book that was only available here in Holland. Next is the task of editing and finding a ghost writer to make it into a book. 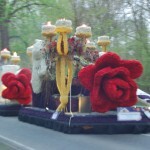 Today was the annual flower parade in the bulb district near here. 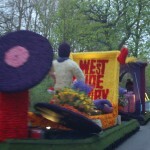 The theme of the floats this year was Musicals. This morning I stood in the home and the adjoining mastmakers shop where my great-great-grandparents lived from 1846 and where my grandfather was born in 1876 in de Lemmer. 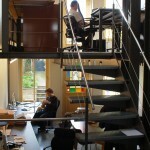 Jelle de Jong now runs his architectural partnership in the former family home. The exterior has been skilfully restored and preserved. The coincidence has it that Jelle has a new task at hand to restore and preserve the home and mastmakers shop on the Polderdijk where our mother was raised and lived till 1927. 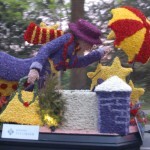 ( see details on my blog of June 26 2010 http://cometosea.us/?p=1357 ). This is good news for me and relatives that the building’s preservation will be in excellent hands. 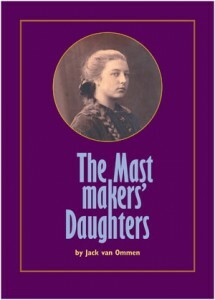 The mastmaker v/d Neut, who bought the premises on the Polderdijk in 1927, closed the shop last year. 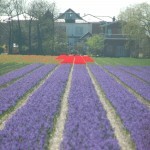 It will now become part of the neighbors bed and breakfast “Veerschip”. Jelle made me a copy of a postcard picture of the Polderdijk taken around 1905, when I turned the postcard over I discovered that this postcard had been sent by our grandfather’s sister to a lady in Apeldoorn, and somehow found it’s way back to de Lemmer and into Jelle’s collection. I had made an appointment with the archivarian in the small town of IJlst where the militairy records are kept from the time of Napoleon. According to family history, my grandfather’s great grandfather Sybolt Ottes de Vries went to war around 1811 and I was anxious to see any specifics of his service records. Most likely he was one of the lucky (chance of 1 outof 10) survivors of Napoleon’s march on Moscow in 1812. 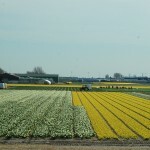 But unfortunately the records did not go back quite that far and Sybolt Ottes did not assume his last name, de Vries, till 1811. 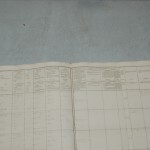 But I was able to find and copy the militairy records of inscription of his son Jan Sybolts (after whom my twin brother is named), who was born during the French occupation, in 1807. I came through the town of IJlst last June and when I crossed the bridge this afternoon, the bridge tender still remembered the American “Fleetwood” putting his one Euro into the wooden shoe. This evening I will be hearing Bach’s Saint Matthew Passion in the Concertgebouw. It is another beautiful Spring day. Close to freezing at night but now it has warmed up to close to 70 F.
I went to mass at the St. Martin and Joseph church in Hillegom. Built in 1927. Very attractive Neo-Gothic construction with laminated roof joists, which had to be one of the earliest applications of laminated beams in Europe. Good choir, good sermon, poor attendance, as usual here. I am at the point in my father’s diary where he recounts the churches bursting at the seams at the end of the war. We had a more recent taste of it after 9-11. Is that what it takes?? 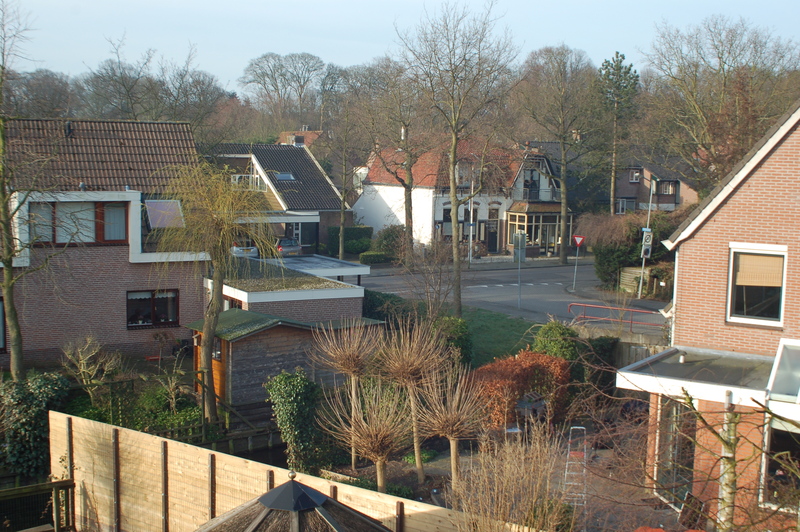 Yesterday Holland witnessed an American style, slaughter/suicide in the nearby town of Alphen. 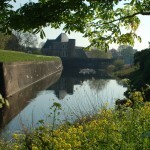 In my previous blog I reported doing my boat shopping, last Thursday, in Alphen. 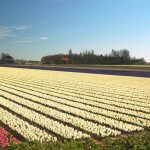 Hillegom is the center of the Dutch bulb industry, so I just had to take a few more pictures on a gorgeous day like today. 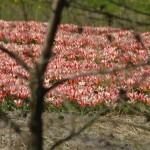 Since it is just a 20 minute bike ride away and it is a beautiful sunny cold Spring day, I took another look if there are any tulips abloom. 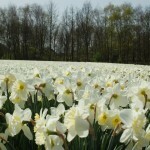 They are short lived once they bloom they are soon cut to stimulate the quality of the bulb. 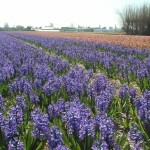 Many are cut before they bloom to be sold for fresh cut flowers. Tuesday I plan make visits in de Lemmer and IJlst. 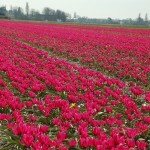 It warmed up to almost 70 degrees Fahrenheit and it wo’nt be long till the Tulips are in full bloom. 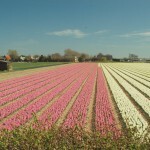 But here is what I managed to photograph on today’s bicycle ride through the bulb fields. 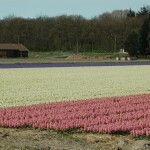 Just a few early Tulips and the last of the Hyacinths and Daffodills. 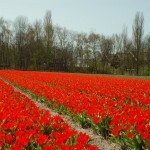 Stay tuned for the full splendor of the Tulip fields and a visit to Keukenhof.